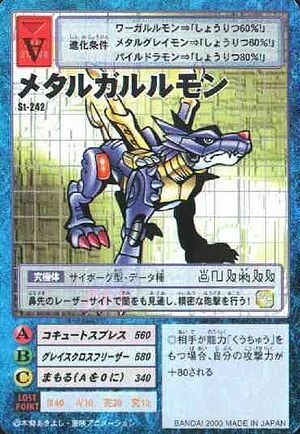 Battle Type Evolution Requirements Were Garurumon + Winning Percentage: 60%! Metal Greymon + Winning Percentage: 60%! Paildramon + Winning Percentage: 80%! The laser sight on its nose allows it to see in the dark and carry out precise attacks! ◎When the opponent has the ability "sky", add 80 to your attack power. This page was last modified on 21 February 2017, at 17:18.